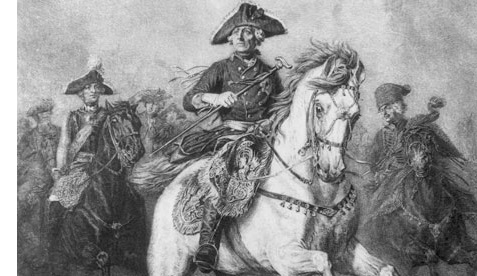 Frederick the Great (1712-1786) - Frederick II was king of Prussia from 1740 to 1786 and a member of the Hohenzollern family, He was the third Hohenzollern monarch, the grandson of Frederick I, who founded the dynasty. Famously known for his military prowess, he was considered a warrior-king, though he hardly resembled one in his early years. His own father, Frederick William I, was a strict disciplinarian, which caused the young prince to rebel in his childhood. At the age of 18 he ran away, along with his close friend, Hans Hermann von Katte, and tried to flee to England (where his uncle, George II, was king). But they were caught before they reached the Prussian border and imprisoned. His father had considered charging Frederick with treason and executing him, but relented at the last minute. Instead, he forced his son to watch the execution of his friend with whom the king had not been so merciful. Von Katte was beheaded. The event was so traumatic that Frederick fainted and suffered from hallucinations for days afterward. He was eventually pardoned and returned to the king's good graces. Ten years later, at the age of 28, he became king upon Frederick William's death. Once free from his father's overbearing personality, Frederick's ability as a military expert became apparent. Within months of becoming king, a longstanding dispute over the region of Silesia broke out between Prussia and Austria. The two conflicts which followed became known as the Silesian Wars (a Third Silesian War was tied into the larger Seven Years' War which was fought amongst most of Europe). The first war was fought between 1740-42 and ended in a victory for Prussia at the Battle of Chotusitz. Most of Silesia was ceded to Prussia, but Austria retained control of the southern portion. It raised Frederick's stature considerably as a military leader and he is credited with molding the Prussian army into an effective fighting force. The second war, fought between 1744-45, also resulted in a Prussian victory after the Battle of Kesselsdorf, and gave the rest of Silesia to Prussia. Toward the end of his reign, he was involved in yet another conflict with Austria, called the War of Bavarian Succession. It was an attempt by Austria to gain control of Bavaria, and Prussia intervened in order to prevent it, which did. During these wars, Frederick demonstrated his ability as masterful tactician, and modern military analysts regard him as one of the greatest of all-time. In fact, Napoleon Bonaparte, the dominate historical figure from this period was a great admirer of his. In 1807, while visiting Frederick's tomb in Potsdam, he said to his officers, "Gentlemen, if this man were still alive, I would not be here." Despite his reputation as a military man, Frederick the Great also expressed interest in the arts. He compiled a personal library of some 3,000 volumes of poetry, ancient classics and French philosophy. And as a music devotee, the Prussian king was an accomplished flautist who wrote about 100 sonatas for the flute, as well as four symphonies. However, he is considered an enlightened despot, meaning he believed that he was vested with absolute authority to rule, so long as it was guided by enlightened thinking. And the fact that he hated Poles calls into question just how enlightened his thinking was. He referred to them as "slovenly Polish trash". Interestingly, he developed a friendship with Voltaire, who, although he despised Frederick's appetite for war, respected him as a monarch (it was to Frederick that Voltaire wrote his statement about Christianity - see above). Frederick died childless, so he was succeeded by his nephew, Frederick William II.